Here are tips for surviving in a water-scarce environment. The City of Cape Town has introduced level 3B water restrictions as dam levels dipped below 40% this week. This fine schedule allows for increased spot fines of up to R5 000. Unsure of what these restrictions may mean for you if you reside in Cape Town? Here’s a quick guide. To help you stem the tide on free-flowing water in your home, we’re sharing handy tips of saving water around the house. We also have a really useful, downloadable tip guide to saving water. Get it here. Don’t use water-based toys like water guns, water balloons, etc. 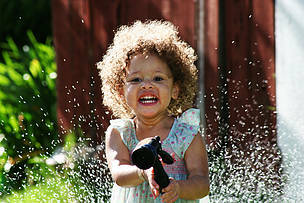 Saving water doesn't mean you can't still have fun.